Jews For Jesus "Rabbi" That Opened Pence Event Had Been Stripped Of His Ordination 15 Years Ago For Libel - Joe.My.God. 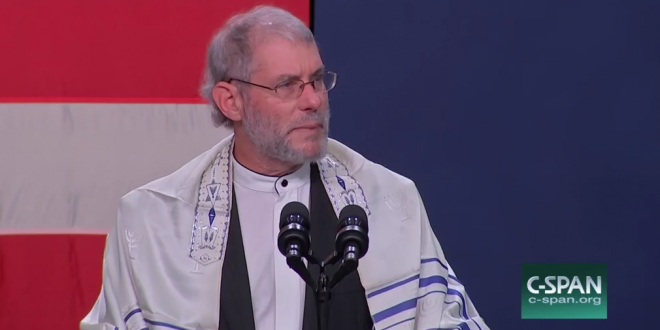 The “Messianic rabbi” who outraged many Jews by invoking the name of Jesus while delivering a prayer in memory of the Pittsburgh synagogue massacre victims was also spurned Tuesday by the organization that ordained him. Loren Jacobs, who was invited onstage by Vice President Mike Pence to speak at a rally in Michigan for a GOP congressional candidate, was defrocked 15 years ago, according to a spokeswoman for the Union of Messianic Jewish Congregations. “Loren Jacobs was stripped of his rabbinic ordination by the UMJC in 2003, after our judicial board found him guilty of libel,” Monique Brumbach said in an email. Brumbach did not say who Jacobs allegedly libeled, but it appears from his synagogue website he was involved in a theological battle with other leaders of the group, which believes that Jesus is the son of God — a belief that is anathema to the vast majority of the world’s Jews. Jacobs seemed to be concerned that the group was insufficiently conservative on doctrinal matters.